Second Degree Mobitz Type 1: A second degree AV Block in which a singular ventricular beat is dropped in a cyclic fashion. With the first atrial impulse of the cycle, there is usually a normal P-R interval. With each succeeding beat, the P-R interval becomes progressively longer, until after several beats an atrial contraction fails to initiate a ventricular response (which results in a long diastolic pause). The P-P interval remains relatively constant. The RR interval progressively shortens with each beat of the cycle. The number of beats in each cycle is not necessarily constant. Second Degree Mobitz Type 2: Recordings in which a single ventricular beat is dropped periodically. However, the P-P and P- R intervals are constant throughout. 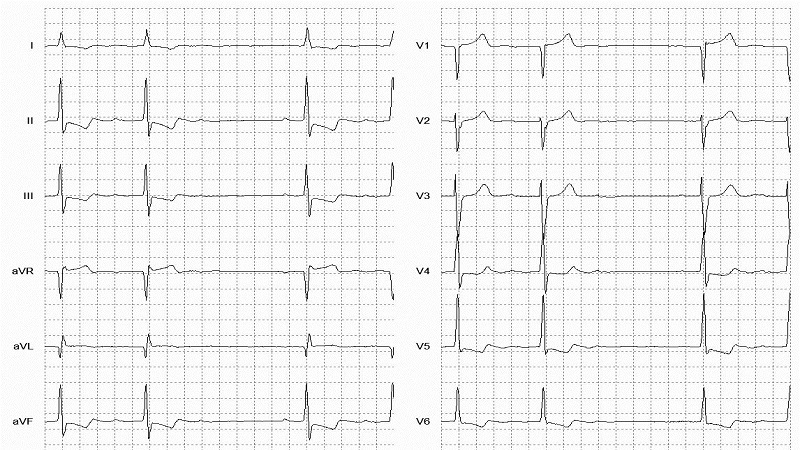 A 2nd degree AV Block with intermittent non- conducted P waves without progressive prolongation of the PR interval. ThePR interval in the conducted beats remains constant. However, First Degree AV Block may also be present. The P waves 'march through' at a constant rate. The RR interval surrounding the dropped beat(s) is an exact multiple of the preceding RR interval (e.g. double the preceding RR interval for a single dropped beat, treble for two dropped beats, etc). There may be no pattern to the conduction blockade, or alternatively there may be a fixed relationship between the P waves and QRS complexes, e.g. 2:1 block, 3:1 block.